The new BMW X4 xDrive 30i is the most impressive vehicle I've driven so far this year. In the past, I have recommended always buying the best vehicle in a class rather than a smaller, cheaper version of a vehicle from that brand. In other words, if you are buying a vehicle in the $30,000 range, don’t buy a “cheap” BMW, Lexus or Mercedes, but rather the top of the line model from a lower priced brand such as a Kia or a Hyundai. This past week I was provided a 2019 BMW X4 xdrive 30i. After spending seven days with it, I am changing my recommendation. THIS, is a vehicle I completely loved and would highly recommend. Sure, it is not in the $30,000 range, but it is not in the typical BMW stratosphere of well over $100,000 either. Priced at $50,450 for the base model ($61,545 as my test model was equipped), this vehicle checks all the boxes for laying claim to being a member of the “Ultimate Driving Machine” class. I absolutely loved everything about it. This is an option I simply could not do without! 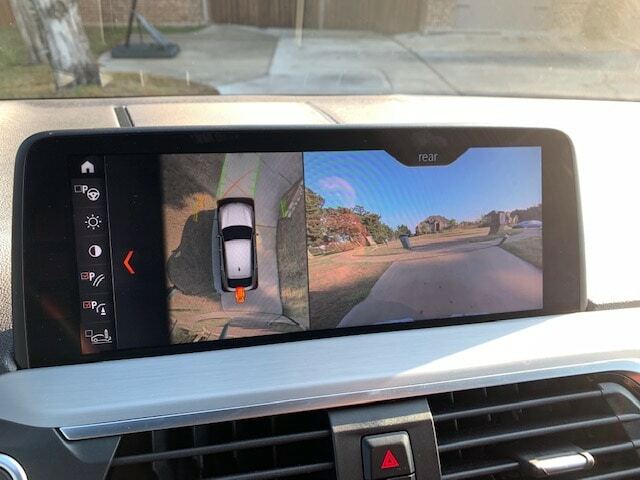 It’s an excellent surround camera which shows how far I have in front, behind and, most importantly, to each side of me when driving around our very complicated driveway. An option I simply could not do without is the excellent surround camera which shows how far I have in front, behind and, most importantly, to each side of me when driving around our very complicated driveway. That Surround View provides a crystal-clear bird’s-eye view of the area around the BMW X4. 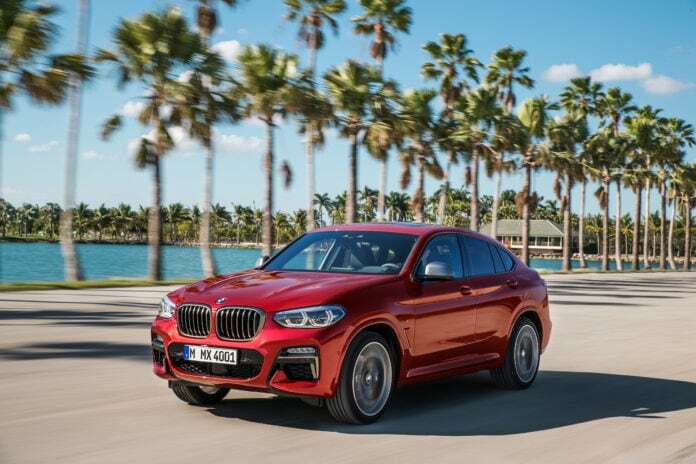 It is just one of the added safety and greater convenience in the BMW X4 that is an option and part of the full-color latest-generation Navigation System with ECO PRO route guidance. The Nav system teams up with BMW’s famous iDrive Controller and touchpad. Mounted on top of the controller, the touchpad allows texts such as a navigation destination to be easily input using a finger. Included with the Navigation System is Advanced Real Time Traffic Information (ARTTI). ARTTI includes a full-color graphic that shows the flow of traffic on major roads and can offer route detours to help avoid traffic jams along the selected route. We enjoyed this feature during a drive far north of Ft. Worth to visit a new Smart Home. We knew exactly what to expect as we continued on this over 40-mile journey there and back. I also loved the Heads-Up Display, even though it caused the system to beep at me, warning that I had exceeded the posted speed limit by more than 10 miles per hour. This seemed to happen all too often since the X4 rode smooth as silk and it was hard to not become a bit of a ground-based rocket ship now and then. There was an array of available driver assistance systems giving us other added measures of safety. Active Driving Assistant + Active Cruise Control with Stop & Go includes Pedestrian and Collision Warning with City Braking function as well as Lane Departure Warning. Another of my favorites is Blind Spot Detection – it has saved my bacon on numerous occasions. Connected Drive Services allow customers to access embedded service as well as select smartphone applications. The available Concierge Service connects the car with a BMW Call Center, providing real-time help with services as varied as making a restaurant reservation or finding the nearest 24 hour pharmacy. The BMW Assist eCall function, meanwhile, takes safety to another level. It is triggered automatically or can be used manually. As soon as the crash sensors report an airbag deployment, the system sends the precise vehicle location and all key information, including an assessment of the likelihood of serious injury, to the BMW Call Center via the built-in SIM card, thus enabling fast and effective assistance at the accident location. BMW Assist eCall as well as BMW Teleservice is standard in every BMW X4, with service included for ten years at no additional charge. With BMW Apps, select third party apps may be accessed and operated using the iDrive Controller and display. Apps which are integrated today using an iPhone include Pandora, Stitcher, Audible, Rhapsody and TuneIn as well as the Amazon Cloud Player. Overall, my test model had $11,095 added to the base $50,480 in terms of features. Looking at what I might have said “was nice but …,” I could say the Tacore Red Vernasce leather seats for $1,700 could be an item I might be willing to shave depending on the dealer’s willingness to discuss. The universal garage door opener at $950 would be a definite no. Most garage doors these days come with a control I can affix to my visor, so I’d seriously have to say “no” to that one. In fact, I have personal cars which have that feature and I have never even bothered to program them to my garage door. Wireless charging? Well, I’ve become accustomed to USB ports and plugging in, so $400 might be a tough decision. The heads-up display, heated front seats and steering wheel ran $1,600. Although that does seem a bit steep, the beeping when I exceed the speed limit by over 10 might save me more than the cost over the life of the X4! Beyond those items, it would simply become a matter of how much the dealer was willing to “work with me,” although I admit I would love working with them about anything having to do with the X4. The list of standard features on it is as long as my arm. Not that I really needed a “sport” button on the automatic transmission because this baby had get up and go to spare, but I really did enjoy pushing it and feeling the power surge with every tap on the accelerator. Driving dynamics certainly have changed over the years with four cylinder engines now providing far more power than eight and even 12 bangers of the past were ever able to do. This model had a 2.0 liter TwinPower Turbo and it provided real driving dynamics. Should I be in the mood to save fuel when driving the X4, that option is also available at the push of another button courtesy of the ECO PRO mode which it engages. ECO PRO adjusts all of the on-board systems for maximum fuel efficiency. It includes a coasting function which shuts off fuel when the driver lifts off the accelerator. It also provides tips to the driver that would help to drive in a more efficient manner. The payoff is shown in the central display which shows how much further the BMW X4 can be driven on the gasoline available in the tank. With the available navigation system, the ECO PRO Route option prompts the driver to select and follow the route to the chosen destination that would use the least amount of fuel. The X4 also features BMW’s auto start/stop function which shuts of the engine when the vehicle comes to a stop in order to avoid wasting fuel when the X4 would otherwise be needlessly idling. I hate to admit it, but I never once pushed the ECO PRO button! This was a week I hated to see come to an end. Thanks to BMW and the Prestige Concierge automotive experience for a great week of ultimate driving! Marlon Hanson has been in the media since 1970, beginning with the New York Daily News. In 1988, he founded Focus Newspapers, expanding the paper from weekly to daily over the past 28 years. He has covered the automotive industry since 1995 and is a three-term president of the Texas Auto Writers Association. Besides Focus Daily News, Hanson is a judge for the Consumers Digest Best Buys, and Auto Judge from TAMA. He also publishes www.testdrivereport.com and focusdailynews.com. His automotive articles appear in Consumers Digest Magazine, Focus Daily News and various other websites and magazines.